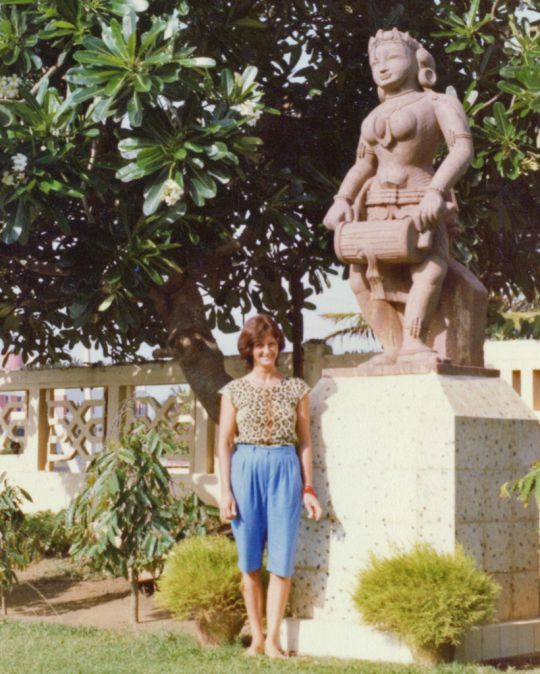 Trisha Donnelly in Puri, India, 1983. Photo by Nicholas Ribush. I first met Trisha sometime around 1976–77. In those days, Jamie and I had just returned to India, where we had met several years earlier. This was not long after both Jamie and I had attended the Seventh and Eighth Kopan Courses, one year apart from each other, and come into contact with the Dharma, the gurus – Lama Yeshe and Lama Zopa Rinpoche – and the Sangha in the person of Dr. Nick. Jamie had known Trisha and her husband Ross before he and I met, somewhere in crazy and wild India, where we were all traveling in those days, looking for new experiences – of which we encountered many, both positive and, sometimes, not so much – and perhaps find new meaning to our lives. If my memory serves me correctly, we met not long after Trisha’s husband had passed away in Australia and she was trying to rearrange her life. At that time, we had left Sister Max’s old house in Safdarjung Enclave in south Delhi and relocated to Civil Lines, old Delhi, where we rented one half of an old British bungalow with a wonderful big garden on Jumna Road, bringing along Mummy Max’s former cook Narayan. In those days, we were involved in the clothing business, working with a few different manufacturers in Delhi. Trisha had helped Jamie in the past, and the general idea was to repay some of that kindness by helping her in turn to find a new purpose and a new life. Trisha moved in with us and became our helper, companion, sister, aunt and baby sitter to our daughter Amanda, and an inspiration and a teacher as well. She knew so much about the Indian way of life, spoke some Hindi, was always smiling and a great help. Together, we roamed the bazaars looking for fabrics, buttons, dyes and other trimmings that our business called for. Together, we visited our manufacturers, controlled quality of garments, supervised a couple of tailors who we had installed in one of the house’s rooms, seconded me when Jamie was in Europe looking after the commercial aspect of our venture, and on her own, looked after things when Jamie and I both happened to be gone somewhere, running the house and supervising production. 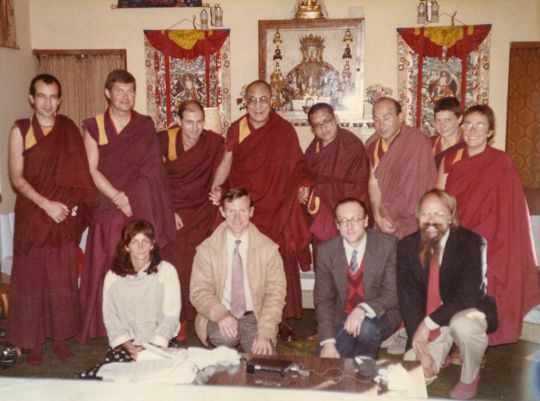 Trisha Donnelly (seated left) with His Holiness the Dalai Lama, Lama Zopa Rinpoche, Pierro Cerri, Neil Huston, Marcel Bertels, Claudio Cipullo, Yeshe Khadro, Robina Courtin, Harvey Horrocks, Massimo Corona and Jeff Nye, at His Holiness’ residence, India, 1984 or 85. Photo courtesy of Lama Yeshe Wisdom Archive. In those days Trisha loved reading novels and, as French books were hard to come by in India, she started my education in English literature, turning me on to Kurt Vonnegut and M. M. Kaye, among others. She gave up reading novels later in her life, when she was in Kopan, quite some time before her ordination, when Rinpoche suggested that perhaps reading novels was too much of a distraction. Where she found the strength to give up on that, I don’t know, but by then she was already very busy with Dharma and charities, and had become an essential part of the running of Kopan, the school and the classes. Sometimes on our rickshaw trips through old Delhi, or on short expeditions to the Imperial Hotel for a gin and tonic now and then, we imagined that we were some English memsahibs of the past! Together, we discovered the Sunday old sari market by the Red Fort and did a lot of hard bargaining in a business that she would later continue on her own to provide funds for Tushita. At that time, Lama Yeshe and Rinpoche often passed through Delhi and we would meet them at one of their hotels or for lunch at Nirula’s. I think that is how how Trisha met the Lamas and became acquainted with Dr. Nick (Nicholas Ribush), with whom she would later collaborate extensively. Trisha always had a huge heart and a great love for all beings. During one of her visits to Dharamsala she met a small orphan boy, Tsering Dorje, and sort of unofficially adopted him. He spent many a day with us in Jumna Road, and later she paid for his tuition in a school somewhere up in Himachal Pradesh. She was heartbroken when he drowned in a swimming accident while still quite young. 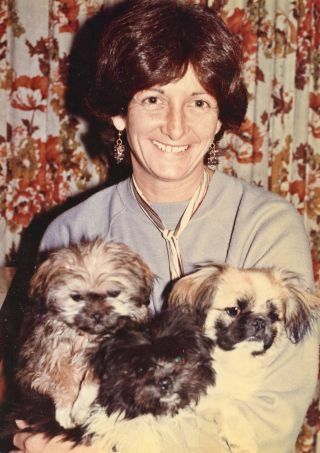 Trisha with three canine friends, Tushita Mahayana Meditation Centre, New Delhi, India, 1981. Photo courtesy of Lama Yeshe Wisdom Archive. She also loved animals and many a dog came our way. I remember one black mutt she called Wapas, which in Hindi means “come back, return.” One day she met him on the street and kept telling him to go away, but he would have none of it and stayed, so the name stuck. She also invited Tibetan monks to stay at the house. One of those monks was present the night a burglar decided to try and cut the wire mesh on the screen on the window above the bed were Amanda and I were sleeping. When I woke, I screamed, and Trisha came running and together we roused the monk and the cook and the chowkidar (watchman, gatekeeper) who was supposed to be guarding the gate but had blissfully slept through the whole commotion in his hut. In 1978, when Jamie and I moved back to Europe to have our second child, Dr. Nick came to stay in the house, and he and Trisha started the early Tushita Centre right there in Jumna Road, before the premises had to be vacated and they eventually moved to Shantiniketan. Trisha loved India and India loved Trisha. She sometimes went back to visit her family in England and I am sure she loved them dearly, but somehow, she had made her life somewhere between North India and the Himalayas, although she had friends all over the world. A note Dr. Nick sent me December 19, 2015, took me on this journey back to these days long past, and to the memories I have of the wonderful human being who passed away today. A strong, dedicated woman whose life has been lived fully, who, even when things were at their worst, never gave up, but just went on and kept up the good work. A person whose love and compassion touched so many lives, humans, animals, friends, family and strangers. An inspiration to me, a friend, a sister at some point in my life, someone who, even if I had not seen her often in recent years, was always present in my thoughts. An example to follow and a friend to remember. Trisha, I miss you very much already and thank you for the days we shared and the things you taught me. May your journey from here on be a happy and peaceful one. Most of the time our grasping at and craving for worldly pleasure does not give us satisfaction. It leads to more dissatisfaction and to psychologically crazier reactions.